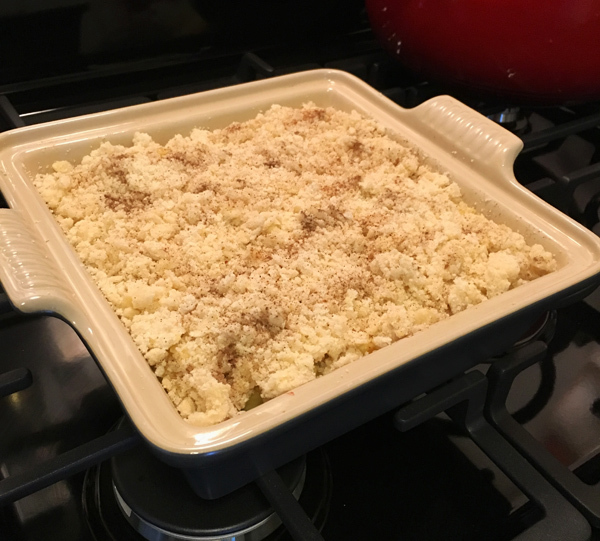 Autumn Apple Crisp | Let's Cook With Bry! Fall leaves and cooler temperatures mean it’s time to fire up the oven and bake delicious comfort foods. We enjoyed this dessert treat every year around Halloween, accompanied by a generous scoop of vanilla bean ice cream. Peel and slice the apples, and lay in a baking dish. Mix the dry ingredients until crumbly. Using your hands, sprinkle the mixture over the apples. Drizzle the oil over the pan from the center out. Sprinkle with the spices to taste. Bake at 350° for 30 – 40 minutes, until the top is golden brown and crispy. Serve with a heapin’ helping of the ice cream. In a large pan, cook over medium heat, stirring until caramelized. Toss in the apples to coat. It’s OK if the caramel becomes too dense, the chunks will melt as the dish is baking.